The stillness of the bush is numbing – the kind of silence that you can’t listen to without suffering a mild bout of panic. A loud deathly quiet. When we arrived at the EcoTraining Camp in the Makuleke Concession it was a matter of weeks since the northernmost reaches of the Kruger National Park had been swept bare by the worst floods in living memory, leaving broad floodplains astride the banks of the Levhuvu and Limpopo Rivers and clearing huge stretches of bush. South of the Levuvhu, the popular and lovely Pafuri picnic site had been washed away completely and the roads to the Pafuri Borderpost, leading ultimately to Mapai and the Limpopo National Park, no longer led anywhere. The camp had been underwater only weeks earlier and head instructor for six years, Bruce Lawson, and his wife Dee, who runs the camp, had kayaked in water three metres deep amongst the fever trees on the swollen Limpopo, more than two kilometres from the river’s normal course, but, with the tents perched up on stilted decks, operations had fast returned to normal and we were there to assess the day-to-day goings-on as far as the trainees were concerned. While the majority of the students – and I use the word loosely – are studying for Field Guide certificates, many of them are mature students taking a break from their careers and others are taking part in shorter courses that anyone can join in order to broaden their bush knowledge. There are week-long courses, perfect for a different bush break, and there is nowhere better to immerse yourself fully in bushlore and bushlife, not to mention survival techniques. But is it a holiday? If you like to walk in the bush, you couldn’t ask for better. We had joined only for a couple of nights but it turned into so much more than an insight into student life. Sheltered under the nyala trees with no power, no cellphone coverage, no television, no internet, buried deep in the silence, our souls stopped searching for solitude and settled into the daily sunrise to sunset routines of this remote spot. Luxurious it isn’t, but is it comfortable? Most definitely. And very well organised. The rules are the same for all students on any course, be it a week (like Bruce’s Wilderness Trails Skills course or the Advanced Birding course), a month (bush trails and firearm handling) or a year, which gives you a full Field Guiding qualification (provided you pass). You sleep in a tent, shared with one other, looking over the bush from under huge shady trees. There is an en-suite loo and piping hot shower. You bring your own lighting – torches and head lamps. You eat in a communal open-sided dining room with the rest of the team and the food, whilst far from gourmet, is tasty and plentiful. Just what you need to sustain you on days of hiking. For that is what it is all about. Hiking; trekking; yomping. 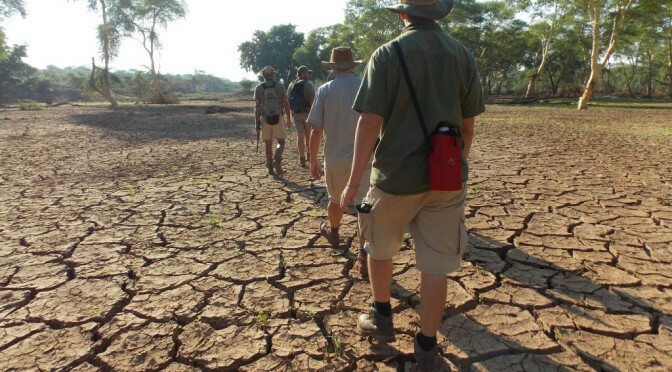 There are few roads on this corner of the Makuleke concession, returned to its owners in 1998 after a successful land claim which left them with one of the most beautiful stretches of our country, across the top of the Kruger from the Levuvhu to the border with Zimbabwe, and the lack of roads means walking. Lots of it. Sometimes 20 kilometres per day, through forests of glowing fever trees and majestic baobabs, over boulder-strewn copies, past rivers and streams and along the banks of pans, old and new. It is truly awe-inspiring. Flanked by trainees armed with rifles and blanks, we looked like the intended-victims of a firing squad each time we set out, but there was no duress here. Sometimes we would push south from the camp along the silt-strewn flood plain, other times take a drive to a distant base from where we would follow the watercourses and wallow in the wildlife and the history of this distant outpost with its evocative landmarks: Lanner Gorge, Crooks’ Corner and, just across the river, the ruins of the great Thulamela, symbol of a people’s past glory. The north of the Kruger has a reputation for poor game-viewing but this is as far from the truth as this region is from the populated south of the park. Bruce explained that the game was only now beginning to return after the floods but it was certainly plentiful. Generous herds of impala mingled with nyala, zebra, wildebeest and kudu. Troops of raiding baboons strode through the scrub. We saw numerous elephants, giraffe, hippos, massive crocodiles and fresh leopard spoor. All on foot. The area offers some of the best bird-watching in the park and we enjoyed incomparable sightings of the rattling cisticola and the wattle-eyed flycatcher, as well as hordes of oxpeckers, both red and yellow. And as the students learned, so did we, about the host-specific nature of those oxpeckers, for example. It was as knowledge-broadening as it was thrilling. Was it dangerous? Not really, although the need for the students to face a certain number of ‘dangerous game encounters’ meant that we probably got closer than most. And nothing can match the thrill of walking into a herd of buffalo, sending them into paroxysms of snorting, standing your ground – forgetting momentarily that most of your unqualified cohorts are armed only with blanks – and then watching those huge-bossed black beasts turn and run, kicking a cloud of dust in your face as they scatter through the undergrowth. No longer silent like night, the bush is now filled with the crash of hooves; the alarm calls of numerous wild creatures float on the air. It is thrilling to the core. I’d do it again tomorrow. Where it is: In the northernmost wedge of the Kruger National Park, surrounded by some of the finest scenery in the land. Why go there: To broaden or brush up on your bush knowledge and tracking skills. To make the step from being a tourist in the bush to being something of a fundi. For the birding. For the solitude. What it has: Basic but comfortable tents with en-suite facilities, lots of good solid food, free teas, coffees and cordials. A fridge full of cold beers, ciders and cold drinks to buy. And Bar Ones. Take your own bird books, torches, comfortable but solid walking shoes and blister plasters. What it’s like: It’s like having your own bush camp and really learning how to get the most out of it. Rates: A one-off R50 entry fee for the Kruger National Park also applies, from which Wild Card holders are exempt. Courses vary in cost. Information on availability at Makuleke and its sister camps, Selati, Karongwe and Mashatu may be found on the website www.ecotraining.co.za. Makuleke’s sister camps also offer similar one-week wildlife photography, tracking and birding courses among others. Getting there: All visitors must leave their vehicles at Pafuri Gate from where camp staff will collect them at 14h00. The gate may be reached from the park of by taking the R525 from Mussina to Tshipise and then on to the gate. It is a 6-7 hour journey from Johannesburg. Contact: EcoTraining Tel: 013 752 4791 Email: enquiries@ecotraining.co.za. We have hired a car from a firm called Glory. White, boxy, Japanese and short on brakes it is completely without suspension and is fitted with a fuel-gauge stuck just below the three quarter-mark even when the tank is as dry as our ultimate destination in the Nyiri Desert, a hundred and fifty kilometres west. But first we have to negotiate Mombasa. Dodging potholes which would swallow a much larger vehicle and weaving northwards towards Kenya’s second city, the sweet smell of spicy samoosas and hand-made crispy cassava chips floats on the heavy air, mingling with the whiff of car fumes and the occasional mild waft of excrement. The sultry Swahili Coast sports a first world veneer with a culture-blending third world buzz. The Call to Prayer from the Mosque-tops overwhelms the chanting of an angelic throng of chorister children in gleaming-white dust-defying frilly frocks, as we lurch past the domed Anglican Cathedral and the power steering gives out. Above the choir, a banner of welcome to a visiting swami swings from the towering streetlights. Everywhere is traffic; the ubiquitous, three-wheeled, three-seater tuk-tuks snake agilely in and out of the matatu minibus taxis, the bicycles and even the occasional camel, all vying for space with the endemic shiny black Mercedes of the political glitterati, mounted with booming loudspeakers and sporting electoral posters adorned with the beaming faces of would-be Presidents, Governors and Members of Parliament. Stalls line pavements and street-corners, here graced with heaps of R30 designer shirts – Lacoste, Polo, even Michael Schumacher – and there with crudely welded pots, pans and skottels. We buy liberally into the shirt collections but resist the cookware and the frequently-touted pirate movies and CDs. With all the gravitas we can muster, we tell him truthfully that we are actually looking for a small foldaway chess set to take camping. He slinks off to find one, returning, moments later, with a selection of giant un-packable marble boards with lion-kings, giraffe-queens and every pawn a Thompson’s gazelle. Another colourful set depicts the tribes of Kenya: Maasai monarchs in unlikely marriages with Kikuyu consorts. A third cheaper but more conventional wooden one has two pawns missing. Our tout tries to palm us off with mismatching gazelle but we resist. He will find the pawns, he says. And off he goes. We return later to fine one pawn recovered – pawn again, you might say – but the other still Missing in Action. We turn down the set but when we eventually buy a Made-in-China one at an expensive toy shop we find that also to be two pawns short. Always check, mate! On checking the car again, the road tax has expired. I have had enough traffic for one day so, leaving my companion at the pawn shop, I call a tuk-tuk. He does just that. As I climb out he demands “Fifty bob”. I give him twenty. We may all be merely pawns in the game but the Road to Glory is only a couple of minutes long at the most. Just head for the tusks on Moi Avenue, Mombasa.